Creating an interesting pose for a bridal party can be a challenge for any photographer. Simply, it's hard to wrangle all those people, and to get them involved in posing that takes a while to set up. 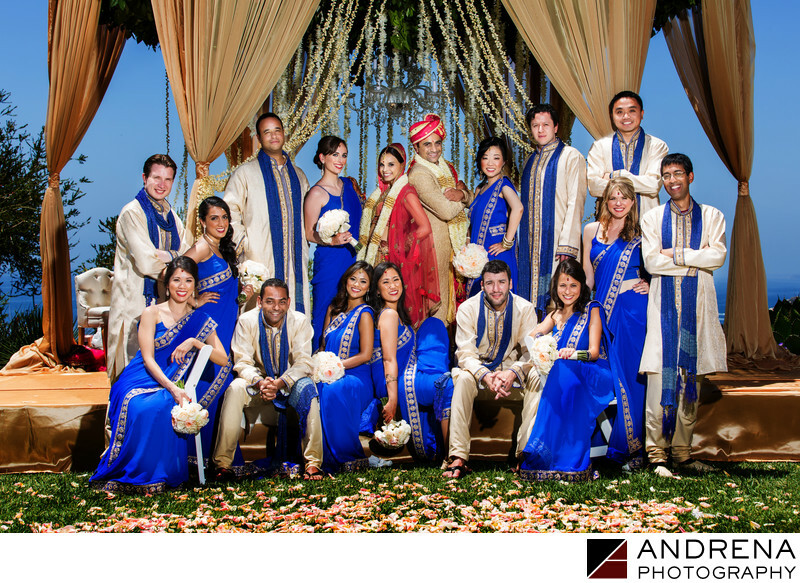 At this Indian wedding, which took place at the Ritz-Carlton Laguna Niguel, everyone was really cooperative, which gave us the time necessary to set up a more interesting bridal party image. I love mixing up the boys and girls, as the final image is always so much more interesting. I also love using varying heights when possible. The use of the mandap for both standing and seated bridal party members helped provide a more interesting composition than if everyone had simple stood in a straight line. This image was shot at mid-day, probably at about 12:30 p.m., in bright sun. The use of a strobe helped fill in the shadows, and creative Photoshop helped add dimension and color to the background. Mandap created by Bloom Box Designs, with coordination by Nutan Shah. Indian wedding photographed at the Ritz-Carlton Laguna Niguel in Dana Point.